Huge project I have been working on for months. 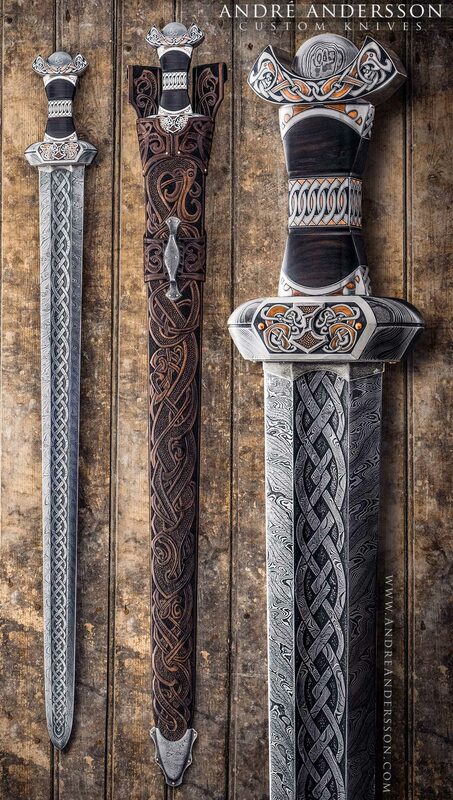 It´s a Viking inspired custom sword fully engraved with a ebony handle and a etched pattern welded steel blade. A fully worked rawhide leather sheath. It´s name is Bjornsvefn, an old Norse name translated to ‘bear dream’ or ‘dreaming bear’. Is this blade for sale by chance? Yes, but please contact me trough E-mail. The most beautiful things I have ever seen. Awesome work! That is amazing what price did you sell it for? I prefer answering questions about price and orders trough E-mail. I’m interested in having a knife made as a family heirloom. Please use my E-mail for order request. Write down a bit what you are looking for and I will give you a price suggestion. Beautifull sword ❤ dull or sharp edge? Was the commision for a decorative only weapon, or a functional/usable weapon? Sharp edge. The commission was for both. Please contact me trough me E-mail so we can have a E-mail conversation regarding your question. If you want a notification in your phone whenever I update my blog, download a RSS reader and add my site to your follow list. I would presonal recommend Feedly both for Android and iOS users.